GIMP is much more than an image editor – it gives you most of the features of Adobe Photoshop, completely free. GIMP (the GNU Image Manipulation Program) is a superb free photo editor, and comes with a huge array of professional-quality functions for fine-tuning snaps and creating your own artwork from scratch. It includes layers, highly customizable brushes, filters and automatic image-enhancement tools, and support for a huge number of plugins (some pre-installed, and others available to download separately). Its active community of contributors means it’s in constant development, and any bugs are squished in short order. It all adds up to make a truly remarkable free photo editor that’s superior to many commercial programs. GIMP (short for GNU Image Manipulation Program) is a free alternative to Photoshop that more than holds its own. But don't think that the lack of a price tag means GIMP is lacking in features; it packs enough punch to genuinely rival Adobe's imaging behemoth. GIMP comes with impressive selection and montage features, various ways to retouch your images, cropping, noise reduction and colour adjustment tools, customisable brushes, gradients and so much more. There's plenty for the more advanced user, too, including layer masks, bezier curves, filters and even an animation package. The interface is highly customizable, and the GIMP community has produced a ton of excellent plugins that are all free to download. The program is loaded with tutorials and there's plenty of assistance to be found in the active and helpful community, so don't worry if you get stuck – help is always at hand. 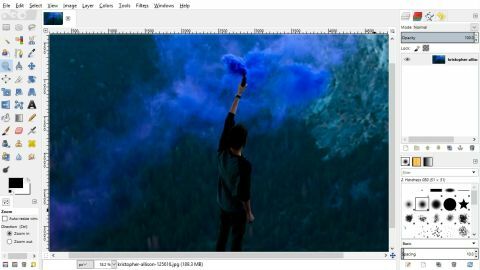 We don't have space to even begin to scratch the surface here, so download GIMP and find out exactly why it's such a popular free alternative to Adobe Photoshop. The latest version of GIMP introduces a new single-window mode, which can be toggled via the Windows menu. You can also collect several layers together into a group – very useful for complex work – and the brush dynamics engine has been improved considerably. For full details of these and other improvements, take a look at the release notes.